Sugar Hut01277 200885work Restaurant - PubSugar Hut Brentwood brings enchantment, mystery and hospitality of the highest international standards to the heart of Essex. 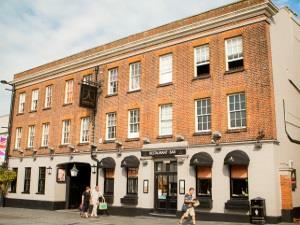 Formerly The White Hart Inn, the venue is believed to have been built in 1480. However, there is evidence that there was a hostelry on the site perhaps a hundred years earlier. Sugar Hut Brentwood is an impressive creation of eight individually characterised zones, united by an attention to immaculate detail underneath the award winning Sugar Hut brand. Sugar Hut Brentwood includes a fine dining restaurant, bars, a night club and a courtyard. Sugar Hut Brentwood brings enchantment, mystery and hospitality of the highest international standards to the heart of Essex. Formerly The White Hart Inn, the venue is believed to have been built in 1480. However, there is evidence that there was a hostelry on the site perhaps a hundred years earlier. Sugar Hut Brentwood is an impressive creation of eight individually characterised zones, united by an attention to immaculate detail underneath the award winning Sugar Hut brand. Sugar Hut Brentwood includes a fine dining restaurant, bars, a night club and a courtyard. Proudly sitting at the heart of Brentwood High Street, Sugar Hut Brentwood has changed the landscape of local expectations by offering an experience of glamour and quality in a truly unique world that can only be understood through experience.